Postcard Invitations are great substitutes for a traditional style invitation as it requires no envelope. No envelope equals less cost and one less step to take in getting them sent out to the recipients. These are faster and easier do it yourself invitations! To make a great DIY postcard invite simply print out our arts and crafts or customizable template onto some heavy weight cardstock. Fill in your party details on one side of the postcard and decorate the opposite side with theme ideas fro your party. You can make birthday invitations, holiday party invitations, bridal shower party invites, and more! There are two different invitations templates styles available here for your DIY enjoyment! Both templates are absolutely free for you to download and use for your next party or get together. 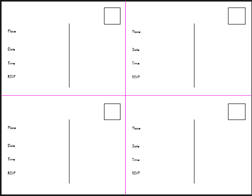 The second template available for download is a customizable interactive template. Use this postcard invitations template to type in your party details and print the invitation straight form your computer. Of course, you may also still want to decorate the opposite side by hand. OR simply attach the postcard to some decorative paper or pretty colored cardstock. Using this template you can not only type in your own wording, but also change the fonts, font size, and color! Use this file postcard template to get as creative as your imagination will take you. Use the post card side to write in your details (place, date, time, etc...), and your address labels. calligraphy is a very good choice! Use the opposite side to go crazy with decoration and arts and craftsy details! Dress up your invitations with great decorative papers, or fabrics. Go crazy with embellishments, stickers, paints or any other arts and crafts supplies that may float your boat. Have fun with it!! Use this template to type in all of the gritty details to your party. You can get pretty creative with fonts and font colors using this template. In the end you may end up with a more modern and clean looking invitation. It is great for a time crunch too. For really quick DIY postcard invitations choose some matching themed scrapbook paper to go along with the theme of your party. Have the paper cut to the same size as the postcards. Print the invitations using our template and make sure to change the font color to one that will coordinate with your matching paper. After printing and cutting the paper simply attach teh decorative themed paper to the back of the postcards and pop em' in the mail! To use this template simply click on the link to download and then save the file to your desktop. Place the text cursor on the page and click where your would like to begin typing. Type in your information and then highlight the text with the cursor. If a tool palette window does not automatically pop up, press control and "E" at the same time. Use the palette to change the font, color, size, and alignment.